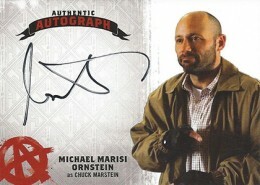 Like the first set, the 2015 Cryptozoic Sons of Anarchy Seasons 4 and 5 Autographs lineup features a strong mix of key stars and notable guest stars. With more than 20 cards, the checklist is also deep. 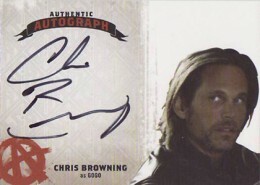 Shop for 2015 Cryptozoic Sons of Anarchy Seasons 4 and 5 Autographs on eBay. 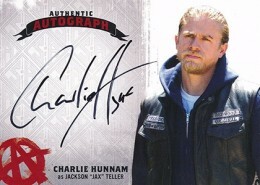 Leading the way is Charlie Hunnam, who plays Jax, the central character in the show. 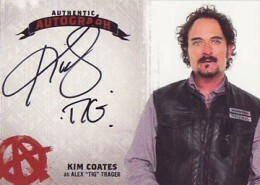 He's surrounded by such family and crew as Katey Sagal (Gemma), Ryan Hurst (Opie), Kim Coates (Tig) and Ron Perlman (Clay). 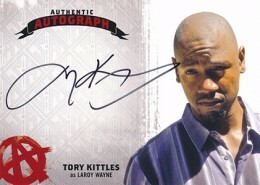 All of these are repeats from the Seasons 1-3 Autographs list. The biggest of the new signers from main cast is Drea de Mateo (Wendy). Her fame reaches beyond Sons of Anarchy and the card might draw attention from fans of The Sopranos. But not all the highlights are show regulars. 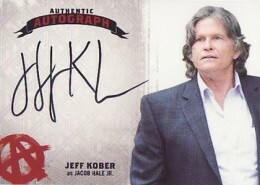 The 2015 Cryptozoic Sons of Anarchy Season 4 and 5 Autographs list also includes some names and faces familiar for their work outside the show. Ashley Tisdale, who rose to fame almost a decade earlier as Sharpay in High School Musical has her first certified autograph card in the set. 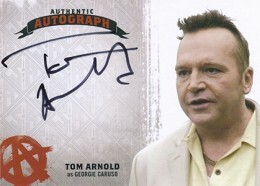 Collectors might also recognize Tom Arnold and Rachel Miner. 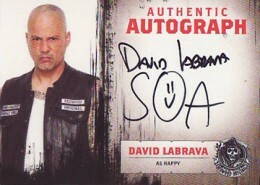 David Labrava, who plays Happy, actually has two cards in the set. There's the one that comes with the standard Seasons 4 and 5 design. 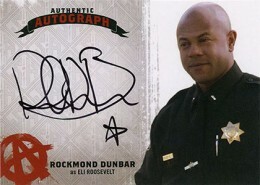 Collectors can also find some that come with the Seasons 1-3 Autographs design. 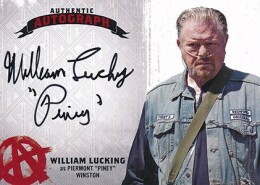 2015 Cryptozoic Sons of Anarchy Seasons 4 and 5 Autographs are inserted 1:24 packs, which works out to one per box. 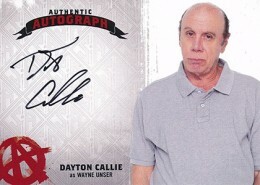 You can see a gallery of all the cards in the set below.